Scalded Flea ...: Cookie Update! 1. Angie & Kristina- Kristina is a teacher who works with high needs children and yet despite challenges in her own life- always has a hug and a smile for the kids. Thanks for the nomination Angie! 2. Pina & Charlie- Charlie is the letter carrier for Ashworth Children's Center. Pina says he always has a smile on his face and a kind word for everyone. Thanks for nominating him Pina! 3. Cheryl & Lanessa - Lanessa lost her Mum this year and she's only 13. I can't even imagine how hard this would be for her. Thanks for thinking of her Cheryl! But... 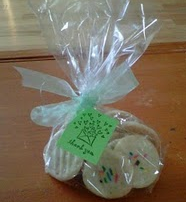 Since I am a total softie..... Everyone else who is nominated should get cookies too! 1. Paulette's neighbor Terry- who shoveled her walk when she wasn't well this winter. 2. Jamie's uncle who lost his wife to cancer this year. Apparently he has a real sweet tooth! 3. Brad's friend Neillie who always helps us out at our cabin. 4. Paulette's brothers girlfriend who is going through a rough time and could use some smiles. 5. My nominations: Kendra, Owen and Uncle Bob. So I have mailed\sent two of the winners treats already. I will keep going and make sure the rest get treats too. Anyone who wants to help.... by all means let me know.